Most history books credit David Lobree with operating the first general store in Middletown. He and his wife Fanny had earlier been merchants in the towns of Clayton and Martinez in Contra Costa County, California. Not long after David and Fanny married in San Pablo, California, they moved to Middletown, where David operated a general store and worked as a Wells Fargo agent. The Lobrees' first child, Elias, was born in Middletown in April 1872. Seven younger children were also born here. Lobree also started one of the earliest vineyards and wineries in the county, twenty to thirty-five acres in Dead Horse Flat east of St. Helena Creek — so named because penurious pioneers dumped their dead horses there instead of properly disposing of the bodies. Lobree is said to have also had a still on this property, which brought considerable additional income, but which he eventually sold to the Pattons for use at the Mill House stage stop on the highway coming down Mt. St. Helena. He later bought a sizable parcel on the Rancho Guenoc and established larger vineyards. In the late 1880s and 1890s, advertisements for his Callayomi Valley Vineyard and Winery assured the public that he produced only pure wines and brandies "especially suited to invalids and for medicinal purposes." He had the largest operation in the Middletown area, producing 75 tons of burgundy and Chasselas in 1871. Lobree was a native of Poland, born in 1838. 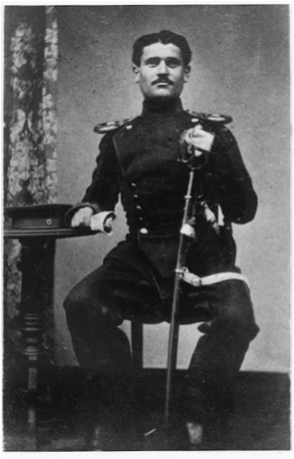 He is seen here wearing the Prussian Army uniform of an Ulan, which means horseman.